8020 Resources / what about "FESTO"
I just got into the mythical aluminium extrude system known as 8020 and am looking for a user group or any other resource forum. I'm playing around with their "Be An Engineer" kit and have tons of entry level questions. But I think I'm wearing out the local distributor and am just not finding a dedicated resource for the stuff. Actually, outside of industrial automation sites and similar, FOG seems to have the most John Q Public 8020 users I've seen. Re: 8020 Resources / what about "FESTO"
I buy all my 8020 on Ebay, where they have a factory outlet. I've often got deals by watching the sales areas. I've not bothered with local distributors as I've never needed anything over 96". Not if they don't display the price. 8020 makes it easy to order. I like that you can buy extrusions by the inch so you don't waste material but I'm very disappointed that the cuts are not square. The tolerance for 80/20 cut extrusion is +/- 1/64 and for the miter cuts the tolerance is +/- 1 degree. Off by a degree makes the stuff pretty much useless for me though they are usually only off a few or several tenths. Still, I now order longer stuff from ebay and cut it myself. It's faster, I get a better cut, and if the stock was overstock it's much cheaper than fresh cut from the factory. McMaster has some of the most popular 8020 items and compatible fasteners cost less at McMaster. If you live close to a McM distribution center you get the stuff delivered the next day via UPS ground. 80/20 stuff is basically a copy of Bosch Basic Mechanical Components which I used to use in the '80s before 80/20 got started. The Bosch stuff is not price competitive with the domestically made 80/20 stock in the US but it might be in GB. Check Rexroth there. Actually, a good place to start is just requesting a free copy of their 900 page catalog. There are so many options available that researching the various combinations of parts is daunting & frustrating on a computer. You'll probably learn more from looking at the catalog for an hour than you will on the internet in 3 hours. Thank you all very much for the replies. I've ordered up an 8020 doorstop (err catalog) and all of the "Made with 8020" guides for perusal and inspiration. Yesterday I had a great time finishing all the "Engineer Kit" projects. Just like the long gone Erector Set. My major malfunction though with this stuff is cutting it up. Sounds like a miter saw is the way to go, but I've not one. I did get an aluminum blade for my TS55, so cutting stock to length and even the 45 degree stuff might be doable. But I'm unsure how to do some of the holes. (see below) I talked with the machine shop lead at school who suggests building jigs that mount to the profile. Has anyone done that? But for some reason, whenever it's time for wood-y stuff, I go back to inches. No excuse on file. Plywood doesn't care how you measure it, but starting an 8020 collection could be a lifestyle decision. Try to avoid designs that require milling holes in the side of the profile. I like to use the hole in the end so the fasteners are hidden. It's easy to tap the existing hole. This is my favorite tools for drilling/tapping aluminum. At McMaster. It's perfect for the hole in 80/20 stuff since the drill helps you align the tap to be parallel to the extrusion. The TS saw is perfect for cutting aluminum. Use speed 5. Hans recommends Walter 53B303 Alucut Metal Cutting Lubricant . It works great. Re-apply whenever the cut edges starts looking matte instead of shiny. I talked with the machine shop lead at school who suggests building jigs that mount to the profile. Has anyone done that? That's imperative if you expect to machine the extrusions with a drill press and you're not using a milling machine. First off is you need to be able to "nest" the profiles so that they don't move, that's the function of the jig. In my case I set up a jig/nest using a hard stop for the extrusion to rest against. In the picture below, that would be the long Woodpeckers extruded rail/rule with the attached mechanical flip stop. Then attach some sort of clamp to the drill press table to secure the extrusion to the table and prevent the 80/20 from moving. The next step is, if you want to drill a hole through the top of the rail you need to determine the exact center of the extrusion. I'll typically use transfer punches that come in increments of 1/64" (.015"), they are easily chucked into a drill press and will locate the center to within .005-.010". This is necessary because if the extrusion is not centered, one of the drill flutes will have more contact with the extrusion than the other flute will and it will force the extrusion to the side and produce the oblong hole that you've identified. Third, is because of the diameter you're drilling, I would take that bite of material in 2 steps. The first step would be a diameter roughly 1/2 of the final diameter and the next would be the finished size. More drill press speed is better than less, but what's more important is the feed rate...easy does it...less is more. You're trying to scrape small amounts of aluminum off the profile and you don't want to "shock" the set-up and move the extrusion. I've been machining aluminum for storefronts and other projects for the last 37 years. I use WD40 that I buy by the gallon and apply using cheap spray bottles. When I first started I was buying the various aluminum cutting and tapping solutions. They are not neccessary. I use aluminum/plastic cutting blades in all my portable and stationary equipment. The new Amana ElectroBlu coated blades are amazing. I have cut thousands of $ worth of storefront and 8020 material and there is virtually no burr. Those 9/16 and 13/16" holes that use the specialized connectors are hard to duplicate without a milling machine and there are more than enough other ways to make connections. Definitey request the catalog. Every time I look at it or the project books I see some new way to incorparate their material into my work flows...A lot like the FOG and Lie Neilsen catalogs. Also, their drilling jigs, while expensive make fabrication much easier. Also, their drilling jigs, while expensive make fabrication much easier. And if you have $60 and nothing better to do you can get the cutter for the anchor fasteners. Thanks again for all the tips, gang. Tools to order grease to grab and things to try. I couldn't find a tool to do that goofball 45 degree hole as I pictured. But it seems like all that really needs is something similar to the drilling jigs linked above, stuck on a 45 profile that gets attached to the work and drilled through. The distributor nearly insisted on bringing the 8020 demo van out, that seems like a good resource I'm going to go for. I have milled the 13/16 holes with a template and a 1/2 inch endmill in my 1400. It does a superb job but you need to be patient. it can be done nicely but I am not sure I would recommend it to everyone. I have been machining metal all of my working life and that helps me understand equal and opposite reactions. The trick is a robust setup where everything is captured and defined. I have milled the 13/16 holes with a template and a 1/2 inch endmill in my 1400. Interesting. I milled aluminum with a router, even surfaced plates, but I always go for a smaller mill in hand held setup. I also find this interesting, especially the template, @greg mann do you have a photo of the template/jig? Also, what speed do you set on the 1400? I've routed aluminum storefront material for locks and pivots and I can honestly say that it is one of the most splincter tightening process' I've ever done. Feeding a handheld router thru a pattern and trying to keep the feed rate low sucked, always used ball end mills and WD40 in an ancient Makita plunger...bought when Makita was the first to offer plungers in the US. I actually just sold this at yard sale last year...probably bought in 81 or so. Worst application was routing access holes over head where the original glaziers had inserted the center pivot into the framing before assembly. Nasty, nasty job! Bought one of these not long ago but not long enough to have tried it. It's nominally a 20 mm hole saw made of high speed steel. It should be able to cut the bore for the 80/20 fasteners that require a 19.4 mm hole. How rough the result would be remains to be seen. It won't be able to do it without help. would be needed to clear the center swarf so the hole saw could proceed. I've routed aluminum storefront material for locks and pivots and I can honestly say that it is one of the most splincter tightening process' I've ever done. I'd certainly agree with that assessment. For some of the more common connectors and fasteners, I've found that "tnutz" on eBay or on their website offers equivalent quality for half the price of 80/20. Thanks for the tip promark! 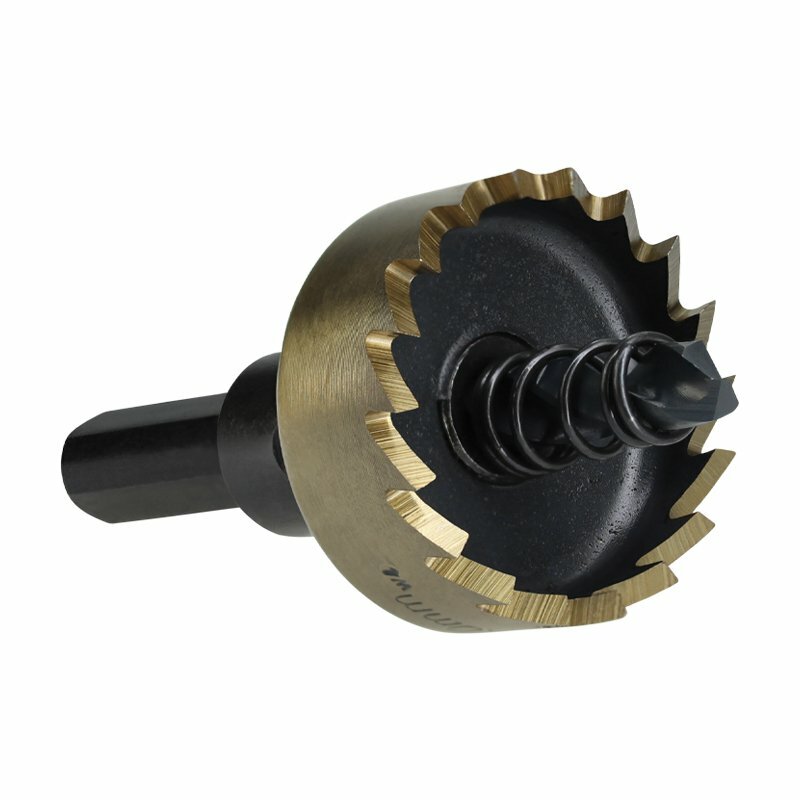 You can find these hole saws with much greater reach, 25 mm and more and with carbide teeth. They (carbide tipped) cut aluminum like butter, producing long continuous shavings and clean hole.